Transcript: Barack Obama's Inaugural Address "Today I say to you that the challenges we face are real. They are serious and they are many. They will not be met easily or in a short span of time. But know this, America -- they will be met," President Barack Obama said in his inaugural address. 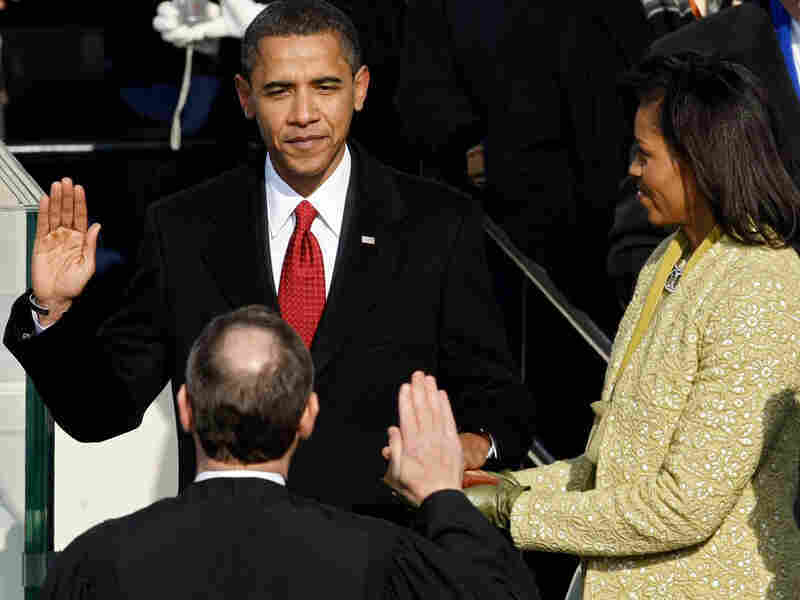 Barack Hussein Obama was sworn in Jan. 20, 2009, as the 44th president of the United States. The following is Barack Obama's inaugural address, as prepared for delivery. In reaffirming the greatness of our nation, we understand that greatness is never a given. It must be earned. Our journey has never been one of short-cuts or settling for less. It has not been the path for the faint-hearted -- for those who prefer leisure over work, or seek only the pleasures of riches and fame. Rather, it has been the risk-takers, the doers, the makers of things -- some celebrated but more often men and women obscure in their labor, who have carried us up the long, rugged path toward prosperity and freedom. Nor is the question before us whether the market is a force for good or ill. Its power to generate wealth and expand freedom is unmatched, but this crisis has reminded us that without a watchful eye, the market can spin out of control - and that a nation cannot prosper long when it favors only the prosperous. The success of our economy has always depended not just on the size of our gross domestic product, but on the reach of our prosperity; on our ability to extend opportunity to every willing heart -- not out of charity, but because it is the surest route to our common good. We are the keepers of this legacy. Guided by these principles once more, we can meet those new threats that demand even greater effort -- even greater cooperation and understanding between nations. We will begin to responsibly leave Iraq to its people and forge a hard-earned peace in Afghanistan. With old friends and former foes, we will work tirelessly to lessen the nuclear threat and roll back the specter of a warming planet. We will not apologize for our way of life, nor will we waver in its defense, and for those who seek to advance their aims by inducing terror and slaughtering innocents, we say to you now that our spirit is stronger and cannot be broken; you cannot outlast us, and we will defeat you. For we know that our patchwork heritage is a strength, not a weakness. We are a nation of Christians and Muslims, Jews and Hindus -- and non-believers. We are shaped by every language and culture, drawn from every end of this Earth; and because we have tasted the bitter swill of civil war and segregation and emerged from that dark chapter stronger and more united, we cannot help but believe that the old hatreds shall someday pass; that the lines of tribe shall soon dissolve; that as the world grows smaller, our common humanity shall reveal itself; and that America must play its role in ushering in a new era of peace. To the Muslim world, we seek a new way forward, based on mutual interest and mutual respect. To those leaders around the globe who seek to sow conflict or blame their society's ills on the West -- know that your people will judge you on what you can build, not what you destroy. To those who cling to power through corruption and deceit and the silencing of dissent, know that you are on the wrong side of history; but that we will extend a hand if you are willing to unclench your fist. Our challenges may be new. The instruments with which we meet them may be new. But those values upon which our success depends -- hard work and honesty, courage and fair play, tolerance and curiosity, loyalty and patriotism -- these things are old. These things are true. They have been the quiet force of progress throughout our history. What is demanded then is a return to these truths. What is required of us now is a new era of responsibility -- a recognition, on the part of every American, that we have duties to ourselves, our nation and the world, duties that we do not grudgingly accept but rather seize gladly, firm in the knowledge that there is nothing so satisfying to the spirit, so defining of our character, than giving our all to a difficult task.